There is always a degree of worry for top-flight teams when paired with lower-league opposition in the cup. That’s something Coleraine have had to deal with in the last two rounds of the Irish Cup when drawn against H&W Welders and Dergview respectively. But, on each occasion, deal with it they most certainly did! 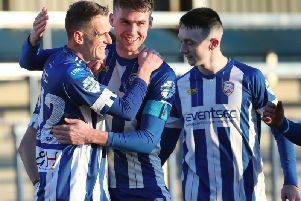 The Bannsiders followed up their 2-0 win over the Welders in round five with a 3-0 reverse of Ivan Sproule’s men in the last 16 of the competition. “I thought we were very professional,” said Coleraine boss Rodney McAree after the game. “In actual fact, I thought we were better in this round against Dergview than we were against the Welders in the last round. “We won both and that’s all that matters in the cup. “It was great that we got a clean sheet, our defensive shape without the ball was much better than it has been in recent weeks and I felt there were good performances throughout. “It was great to get the two new lads signed this week some gametime and they done extremely well. Ben Doherty and James McLaughlin settled whatever nerves the hosts might have had with first-half strikes before debutant Dean Shiels wrapped things up in the second half when he scored minutes after coming off the bench. “The more areas we can get goals coming from the better,” said McAree. “James McLaughlin is back amongst the goals again, which he is always going to be. “I thought Ben Doherty done well and Mark Edgar was exceptional. “It was nice to get a goal early doors as it settles everyone down. “I thought Dean done very well. “When the game started to open up and the pitch got that little bit bigger, Dean was the ideal man to bring on. While Coleraine may have picked up the win as expected, Dergview can be pleased with how they went about their business. “I think we do try and pass the ball about, even across the back four,” said boss Ivan Sproule. “I don’t like ‘route one’ football as it’s not the type of football I was coached. “In our league campaign we are fighting for our lives and sometimes we have to go more direct. “But I thought today it was a chance for our young players to express themselves and show no fear. “My players will learn from the likes of Stephen Lowry, who is head and shoulders above the rest as he controls the game with his passing and strength. “When you’re away to the Irish Cup holders and concede in the first few minutes you think for the worst. “We came with a gameplan, I told the players we had a chance as anything can happen in football. 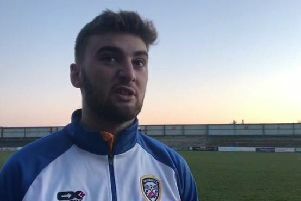 “If I had told the players you were coming away to the Irish Cup holders with ex-internationals coming off the bench and one thing or another, then you’re beat before you start. “I told the players during the week that I had belief that they could get a positive result and they came and gave everything they had. COLERAINE: Johns, Mullan, Lowry (O’Donnell, 75), McLaughlin (Shiels, 63), McConaghie (King, 73), Parkhill, McGonigle, Canning, Doherty, Edgar, Glackin. Subs (Not Used): Doherty, Douglas, Bradley, Crown. DERGVIEW: McElroy, M.Buchanan, Falconer, Maxwell, McNulty, Callaghan, A.Buchanan (Burns, 55), Doherty (Cn.Crawford, 64), McGuckin (Aiken, 82), A.Sproule, Kirk. Subs Not Used: Burns, A Buchanan, C.Crawford, Harpur.